Maruti Suzuki’s WagonR is synonymous with the word practical. It didn’t earn the tag in the last one or two years, but right from when it was first introduced in 1999. With over 2 million examples on Indian roads, the WagonR is a successful and trusted nameplate. The new WagonR, which is now in its third generation, has all the ingredients, if not more, to retain its crown as the most practical hatchback. It’s bigger on the outside, more spacious on the inside and even gets a larger boot as well. Update: The Wagon R is also available in a CNG variant. This is only available in the LXI and LXI(O) trim with the 1.0-litre engine. Read all about it here. At the same time, it has become a lot more modern thanks to all the new equipment that’s on offer. There’s a greater focus on making it safer and nicer to drive courtesy of a new platform and a more powerful engine. We drove the latest iteration of the WagonR to find out the extent to which it has evolved and whether you should buy one, even if practicality is not the first thing on your mind. Here we go. The new hatchback is unmistakably WagonR, even if it’s viewed from a distance. It’s still tall, but the larger dimensions make it more proportionate. Let’s just say it looks less awkward now. Apart from new headlamps and tail lamps, it has also gained some curves on its body. However, it still resembles the older model from many angles. The novelty factor comes across mainly through its new orange body colour option and the floating roof design. The new WagonR is based on the Ignis’ Heartect A platform and is bigger than the older model. It’s 56mm longer and 125mm wider, and the increase in size is noticeable to the naked eye as well. The wheelbase has also gone up by 35mm. On paper, the new WagonR is shorter than the older model by 25mm. The difference in height though is mostly down to the fact that the previous version had roof rails while this one doesn’t. Unlike the second-gen WagonR, which featured alloy wheels and projector headlamps in the top-spec Vxi+ variant (also known as the Stingray), the new WagonR gets multi-reflector halogen headlamps, while full wheel covers are reserved for the all-new top-spec variant, the Zxi. Although there’s no provision to upgrade your headlamps, Maruti Suzuki offers 14-inch alloy wheels as optional accessories for the third-gen WagonR. They are priced at Rs 4,900 per wheel. Step a little closer to the new WagonR and you’ll notice the new design elements on its skin. The large pull-back headlamps have a unique kink on the side and there’s now a shoulder line that runs along the length of the car. There’s even a recess above the front and rear wheel arches. These additions, along with the floating roof design, make the WagonR look a lot less plain jane now. Even at the rear, while the license plate is in its usual place on the bootlid, the waterfall-like tail lamps make the new WagonR look contemporary. But talk of being with the times, and you’ll realise that the WagonR misses out on DRLs (daytime running lights), which should have been offered at least on the top variant. The new WagonR’s doors open wide and you still walk into the cabin (well, nearly). The cabin is done in light beige and black and feels roomy despite the fact that most of the parts inside, including the A-pillars, are finished in black. Needless to say, there’s no dearth of headroom for someone my size (5’8”) and I’m quite sure even a six-footer won’t complain either. But short drivers will have a grouse: the driver’s seat is not height-adjustable, and like before, you sit far away from the windscreen. So if you’re someone who likes to have the bonnet in your field of vision, you might have to keep a cushion handy. But it’s easy to get into a good driving position in the new WagonR as the steering wheel is now tilt-adjustable. The steering wheel is the same unit as the Ignis’; it’s good to hold and feels upmarket too. There’s also an improvement in the quality of interior plastics, but consistency in quality is still questionable. For instance, the plastic used on the centre console below the handbrake lever looked quite flimsy on our test car. The WagonR gets a new instrument console with an orange backlight. There’s a large analogue speedometer, which is somewhat reminiscent of the Ritz’s unit, while the tachometer, fuel gauge and trip meter readings are now displayed on a circular digital meter that sits towards the right. There’s a provision to display fuel efficiency on the infotainment system in the top variant of the WagonR, and it might prompt you to change your driving habits, which is good for the environment too. The infotainment system, which Maruti calls the SmartPlay Studio, is completely new and gets both Apple CarPlay and Android Auto. There are a host of apps that you can download on your smartphone, including Navimaps and Aha radio, to add various functionality like offline maps and favourite radio channels to the system. While the touchscreen is fairly responsive to finger inputs, Maruti’s SmartPlay Studio app also gives you an option to turn your smartphone into a remote control. The infotainment unit is placed in the middle of the dashboard and juts out slightly. There are AC vents on each side of the system; one angled towards the passenger and other towards the driver. Both of them can’t be shut completely and the one that is angled towards the driver blows cold air on either the steering wheel or the roof and sometimes even the legs; the rare case when you get to complain about the ergonomics in a Maruti car. Speaking of utility, there’s a bottle holder in each door with some extra room to keep your knick-knacks. There’s a storage space under the passenger seat as well, and a cup holder just ahead of the handbrake lever in the console between the two front seats. Owners of the older model would be familiar with a pop-out style cup holder on the right side of the dashboard. It’s not there in the new WagonR, though there is enough space there for Maruti to have added it. And the second smaller glove compartment on the top of the main glovebox is also missing, for a good reason though; there’s an airbag there. Now that we’re on it, the WagonR gets driver airbag as standard, while a passenger side airbag is a part of the options list on all variants (priced at Rs 6,500 on L and V). Ticking this option also gets you front seatbelts with pretensioner and load limiter, which is another active safety feature. Since we’re talking safety, the new WagonR’s Heartect A platform is also stronger than the platform on which the second-gen WagonR was developed. This should enable the new hatchback comply with upcoming Indian crash test standards. Some of the other features on offer on the new WagonR that add to the driver’s convenience are one-touch down front power window, day/night IRVM, rear parking sensors (standard), rear defogger, rear wiper and washer, electrically adjustable and foldable ORVMs and speed-sensitive auto door lock. The WagonR’s backseat is now more spacious than before. With the front seat set to my liking, there was ample headroom and legroom on offer, so much so that even if I was 2-3 inches taller, it might have still been plenty. There’s also space under the front seat for the rear passenger to rest his/her feet comfortably, and that adds to the leg space. It’s imperative to add here that when you sit at the rear and look at the opposite end’s A-pillar, you appreciate the sense of space in the new WagonR even more. But the rear passenger doesn’t have much to be excited about other than this. Here’s why. While the WagonR’s rear seat is spacious, it gets fixed headrests which don’t offer enough support for average-sized adults. The underthigh support on the rear bench could also have been better and Maruti could have provided a 12V socket for rear passengers too. I would have also liked if the controls for the rear power windows were placed slightly forward as the current placement is just too close to operate comfortably. Replace humans with luggage of any size and type, and the WagonR comes into its own element. The rear seat is 60:40 split, which means even unusually long things can be stowed easily, while still leaving space for a homo sapien at the rear. The new WagonR’s boot volume is rated at 341 litres, which is even more than that of the Vitara Brezza (328-litre). And you only have to see it to believe that it will be able to transfer two passengers and their luggage to the airport with ease. On the other hand, even with a CNG cylinder in the boot, there’s enough space to carry a weekend’s worth of shopping. Overall, if you just take utility and space into account, then the new WagonR is a big step up from the older model. I, however, feel that the rear bench could have been more comfortable -- there’s so much space that Maruti Suzuki could have even offered a two-step reclinable rear seat. Shifting focus back on to the driver and his machinery, buyers trading in their entry-level car for the third-gen WagonR have enough reasons to call their new set of wheels an upgrade. Not only is the new WagonR significantly bigger than the Alto and Kwid, it’s also quite powerful thanks to the 1.2-litre petrol engine, which dishes out 83PS, under its hood. There’s also the 1.0-litre engine on offer, but only in the L and V variants. Both engines can be had with either a manual transmission or an AMT. The CNG variant is available only in the L trim and with only the 1.0-litre engine. Maruti haven't released power and torque figures for the same but claim 33.54 km/kg for efficiency. The claimed efficiency for the petrol fueled 1.0-litre engine is 22.5kmpl and for the 1.2-litre petrol the claimed figure is 21.5kmpl. The 1.2-litre engine is a familiar unit. It’s the same unit that powers the Ignis and here, it’s offered in same state of tune as well (83PS, 113Nm). With a common platform between the two cars, the real question is whether has attempted to give the new WagonR an image makeover? Well, the answer is a simple no. Yes, the bigger engine does make the new WagonR a peppy car to drive, whether you are tackling city traffic or taking the family on a weekend getaway. The suspension is tuned in favour of comfort rather than handling. So the new WagonR will go over minor road undulations without unsettling its passengers, and even major ones are dealt with relative grace. There is a new level of maturity in the WagonR’s ride and you won’t hear its suspension crash when dealing with large potholes. But while the ride is sorted, the heavy steering wheel and engine noise (surprised?!) might worry drivers. The heavy steering is prominent at parking speeds, but it gets lighter as you pick up the pace. Out on the open road, the soft suspension results in a bit of body roll, which ensures you keep your enthusiasm in check. The 1.2-litre K-series engine loves to rev and, as we’ve experienced in other Maruti cars, isn’t noisy even when revved hard either. But the engine noise is more apparent inside the cabin of the new WagonR than in the Ignis or Swift. This is probably down to the amount of insulation, or lack thereof, in the new WagonR. However, it still feels a lot more sophisticated to drive when compared to the older model. The one thing that drivers will like is the small turning radius. Despite its bigger dimensions, the turning radius has gone up by just 0.1m, to 4.7m. Other driver controls like the clutch and gear lever are light to operate and suitable for a car that is meant to be driven on narrow and busy streets. Equipped with Maruti Suzuki’s famed 1.2-litre engine, the WagonR is now a more convincing upgrade over other smaller cars. Owners of the older Wagon R, some of whom are known to be repeat customers, will definitely want to take a look at the new WagonR. It is significantly bigger and more practical than before, and the maturity in the way it drives makes the new Wagon R a lot more pleasing to be in. The new engine also makes it more peppy and multiplies the utility factor as it gives the hatchback enough grunt to carry a full house with relative ease. Where the package could have done better is in terms of what’s on offer for the rear passengers. While the rear seat is spacious, it misses a few aspects that would have helped enhance passenger comfort significantly. When you factor in its larger proportions and added features without a nary a jump in the price tag, it makes even more sense than before. The top variant with the 1.2-litre engine and AMT is priced at Rs 5.69 lakh, which is Rs 33,000 more than the top-spec model of the older model that was equipped with the 1.0-litre engine and AMT. The CNG variants are priced at Rs 4.84 lakh for the LXI and 4.89 lakh for the LXI(O). This is a premium of Rs 65,000 over the standard base level trim. 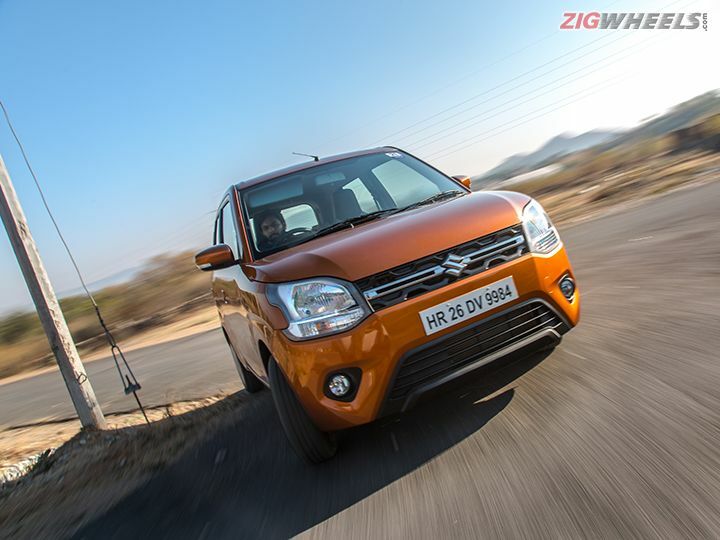 Considering Maruti is only charging Rs 20,000 more for the 1.2-litre engine over the smaller motor in the latest generation WagonR, the incremental price over the outgoing version is acceptable and that makes the WagonR a more sensible buy than ever before. And yes, while we wouldn’t call it desirable, it is a car that seems more enjoyable as you spend more time in it.